G Dragon and T.O.P recently performed at Kim Jung Eun's Chocolate, promoting their latest album, GD&TOP. The duo once again both wore garments from Instantology. G Dragon wore Mixed Color Spangle Trench Coat. He spices up his outfit with a yellow tie and green belt to keep it exciting. 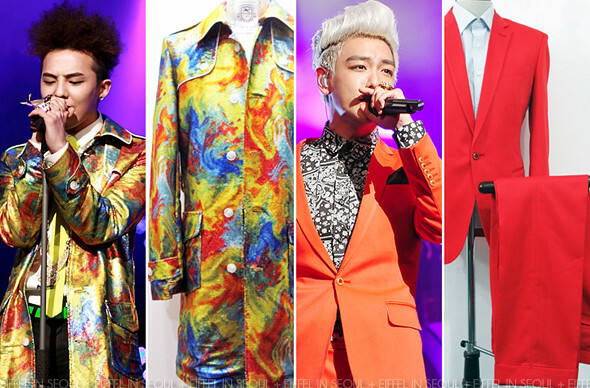 I personally loved the coat on it's own, vibrant and loud.. something GD would wear. I thought the tie and belt may have stolen some of the coat's limelight but his outfit works overall. 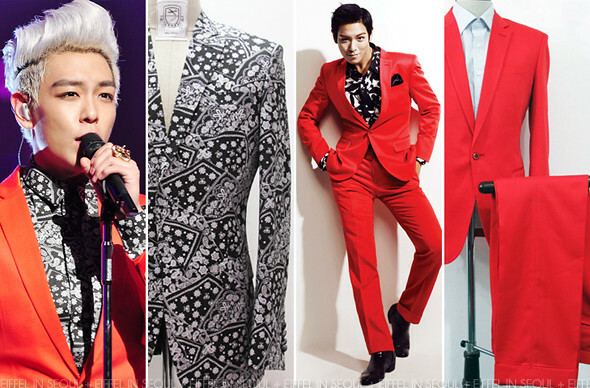 You may remember seeing T.O.P wearing the same suit in his previous feature with Arena Homme+ back in July 2010. The Faded Red One Button Suit with Narrow Lapel was specially customized for Arena Homme+. I guess you just can't keep the good stuff in your closet to collect dust. With so many fantastic outfits customized by Instantology, they definitely deserve to hold an exhibition or showcase to have them on display! I really liked what T.O.P was wearing, much more than G Dragon. Who do you prefer?